Now that Halloween is behind us, Thanksgiving is just a few weeks away! For years, this holiday was a time to get together with my extended family in Tennessee and eat huge platefuls of turkey and butter-and-cheese-laden casseroles, followed by a table of pies, cakes, and other desserts. (And eventually, a nap!) I always love being with my family, but once I got older, battling crowded airports became less fun, and I didn't love the way I felt after I ate such a gut-busting meal. After Brandon and I got married, we decided to stay put for Thanksgiving, and to start the tradition of hosting a big meal for friends. Suddenly there was no traveling, I could cook the (healthier) foods I loved, and we could spend the holiday with our NYC family. 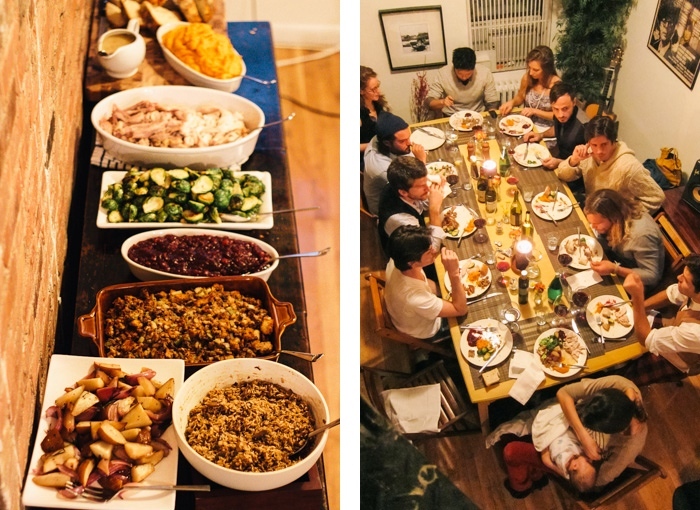 We've hosted two Thanksgivings in our apartment so far, and are hosting another one in a few weeks. It's quickly become one of my favorite days of the year! Sure, it takes some work to host 12 people for dinner (not to mention brining a turkey in my tiny kitchen), but it's a blast. All that to say: I'm teaching a class all about Thanksgiving next Wednesday, November 13 at the Chelsea West Elm, and I'd love for you to come!! Each student will receive a packet of delicious, healthy Thanksgiving recipes from The Yellow Table (including Herb-Roasted Turkey with Apple Cider Brine, Kale Salad with Roasted Delicata Squash and Pomegranate Seeds, Farro with Wild Mushrooms, and Roasted Brussels Sprouts with Lemon & Pecorino) and walk through a game-plan for pre-party prep. I'll demo how to make simple hors d'oeuvres like Endive Spears with Blue Cheese, Pears, and Walnuts (with Sherry-Shallot Vinaigrette), Spicy Maple & Rosemary-Roasted Nuts, and Crostini with Brie and Sundried Tomato Tapenade (and you'll be the taste-testers!). Lastly, I'll share ideas for simple table-styling tricks and pour three of my favorite Thanksgiving Day wines from Le Du's wines. Cost: $10* Click here to sign up!! AND...the first 3 people to sign up via this post today get to bring a friend for FREE! Once you've signed up, email me at anna@theyellowtable.com and I'll send you the special discount code for your friend. Offer expires after today (Nov. 4, 2013). Hope to see some of you at the class - it will be so fun, and I've got another one in the works for early December. Stay tuned! !